I've wanted to take a photo workshop or online class for quite a while. I haven't been able to either find what I want or afford what looks good. So when a fellow blogger and Facebook friend, Virginia Kelser Jones, mentioned this book, Visual Poetry, on her FB page, I was intrigued. I researched it a bit on Amazon (love that you can flip through the first few pages) and also went to Chris Orwig's websites: his personal one and the one he's set up as a companion to the book. I really liked what I saw, so I purchased the book. I've read the first four chapters twice! 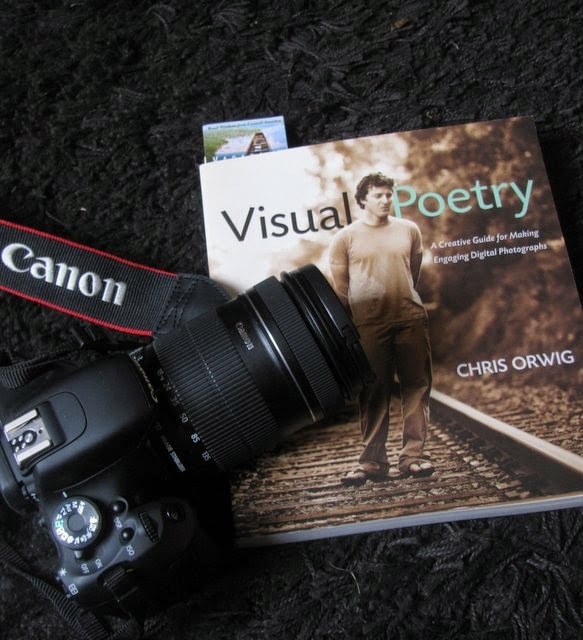 The content is very rich and draws comparisons between a poem and a visualizing arresting photograph. There is some technical stuff...f/stop, ISO, focal length, lens use, etc. but not so much to make it difficult. Chris has a relaxed, uncomplicated style. I like that. Any volunteers for a portrait shoot? ?